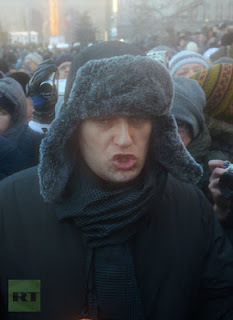 Alexei Navalny - US funded "activist." December 16, 2012 (LD) - Saturday, December 15 saw a disappointing show for Western-backed protesters in Moscow - with estimates of only a few hundred showing up. Led by faux-Communist Sergey Udaltsov and confirmed Western-funded opposition leaders Alexei Navalny, Ilya Yashin, and Boris Nemtsov, even the Western media had to admit the momentum they had hoped to incite is failing to materialize. AFP's "Year on, Russian opposition subdued but not defeated," and Washington Post's "Thousands protest against Putin, but opposition momentum has slowed," despite unqualified attempts to embellish the size and strength of both the protest and the opposition in general, reflect the winding down of Western attempts to foment chaos across Russia. While the Washington Post cites Russian President Vladamir Putin's "co-opting" of opposition issues, by actually addressing legitimate concerns regarding his government, there is also another dimension that is more muted. The Russian Battle Against Foreign Subversion. Putin was elected to a six-year third term in March and the parliament, dominated by his party, has pushed through laws which critics say can be used to stifle dissent - tightening controls of the Internet, imposing new checks on foreign-funded lobby groups and broadening the definition of treason. Indeed, Russia has placed immense restrictions on foreign-funded lobby groups and NGOs, demanding that they exhibit the same level of transparency and honesty that they themselves demand of the government. Foreign subversion, however, requires a degree of deceit and exploitation toward targeted segments of the population. Subversion will not work if its agents are required to state on all their pamphlets, websites, and signs that they are foreign-funded - and predictably both the US and the opposition it has contrived inside Russia, derided the pro-transparency legislation. US Ambassador McFaul himself has chaired the US National Endowment for Democracy and Freedom House, both of which directly fund and support many amongst the "Russian" opposition. In other words Nemtsov in his early 2012 US Embassy appearance, was visiting his paymaster. "Navalny spearheads legal challenges on behalf of minority shareholders in large Russian companies, including Gazprom, Bank VTB, Sberbank, Rosneft, Transneft, and Surgutneftegaz, through the Union of Minority Shareholders. He has successfully forced companies to disclose more information to their shareholders and has sued individual managers at several major corporations for allegedly corrupt practices. Navalny is also co-founder of the Democratic Alternative [DA!] movement and was vice-chairman of the Moscow branch of the political party YABLOKO. In 2010, he launched RosPil, a public project funded by unprecedented fundraising in Russia. In 2011, Navalny started RosYama, which combats fraud in the road construction sector." Alexey was involved in founding a movement directly funded by the US government and to this day has the very people who funded DA! defending him throughout the Western media. The mention of co-founder Mariya Gaydar is also revealing, as she has long collaborated, and occasionally has been arrested with, Ilya Yashin, yet another leader of a NED-funded Russian "activist" opposition group. Photo: Alexei Navalny, Yale World Fellow and co-founder of US National Endowment for Democracy Da! or "Democratic Alternative/Yes in Russian." It is yet another Otpor-esque organization courtesy of the United States government and willful traitors to their motherland. To draw greater attention to the issue of freedom of assembly in Russia and to the “Strategy 31” movement, which seeks to protect this fundamental right. The organization will train a network of regional activists and coordinate their activities through mini-seminars and field visits, and conduct an information cam­paign through press conferences, posters, and educational handouts pertaining to freedom of assembly, to be distributed to the general public by regional partners." This is also confirmed in NED's "Democracy Digest" where the "Moscow Helsinki Group" is explicitly stated as leading Strategy 31 marches and that the group is a "long-time grantee of the National Endowment of Democracy." Worst yet, Yashin's People's Freedom Party is lined not with aspiring youth seeking "freedom" for the Russian people, but rather lined with career politicians and businessmen collaborating with foreign-interests. Among them is Vladimir Ryzhkov, a member of the NED-funded, Washington-based World Movement for Democracy. There is also Boris Nemtsov whose adviser, Vladimir Kara-Murza (of Solidarnost) recently took part in a September 14, 2011 NED-sponsored event titled, "Elections in Russia: Polling and Perspectives" where they used a NED-funded polling organization, the "Levada Center," to project "winners" in upcoming elections and study the Manezh riots of 2010 - for now obvious reasons as the US attempts to fan the flames of unrest across Russia. Russia Faces Subversion, not Revolution. Like the West is attempting to do around the world, from Egypt to Tunisia, from Libya to Syria, and across Asia, it is couching hegemonic expansion within the cause of "democracy" and "freedom," diminishing both as it exploits the well-meaning intentions of millions around the world. The closing of the US NGO cash spigot in Russia and the subsequent petering out of the so-called opposition is not a coincidence - it is yet another exhibit of Western duplicity and its abuse of both the masses, and the better lives they seek.